The pioneers in modern science and technology conferences, back again to revolutionize the future of next generation technologies. 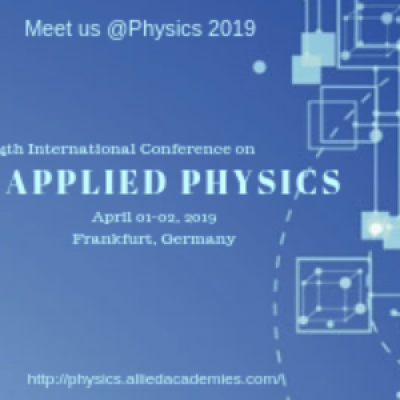 Physics Conference 2019 lays a platform for the researching community and industrial institutes to gather and form a network to present their research works and expertise on April 15-16, 2019 at Frankfurt, Germany. This year the Physics meeting enables the delegates and students to comprehend the recent discoveries, innovations and technologies from researchers in diverse fields and have a deep knowledge on the impacts of these technologies in the future. Physics Conference 2019 provides an opportunity to connect with the leading scientists and researchers in the field of Physics. Join us at Physics 2019, the technological forum that connects the distinguished industrialists and academicians all over the world in the field of Physics, Acoustics, Laser Optics, Photonics and Photovoltaics, Medical Physics, Clinical Imaging, Quantum Physics, Nanotechnology, Biophysics, Materials Science, Microscopy, Astronomy, Mathematics, Energy Physics and more. Vortrag "Ist das heilig oder kann das weg?"